BALOO & OWLS Training in a single course. Sat. Nov. 15, 2014@Pouch. Pre-registration is required. 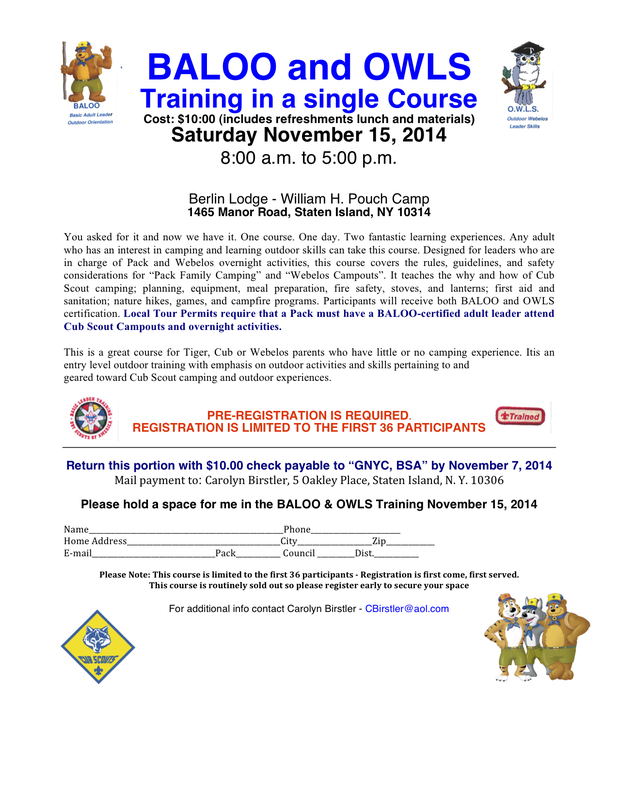 This is a great course for Tiger, Cub or Webelos parents who have little or no camping experience. Itis an entry level outdoor training with emphasis on outdoor activities and skills pertaining to and geared toward Cub Scout camping and outdoor experiences. Any adult who has an interest in camping and learning outdoor skills can take this course. Designed for leaders who are in charge of Pack and Webelos overnight activities, this course covers the rules, guidelines, and safety considerations for “Pack Family Camping” and “Webelos Campouts”. 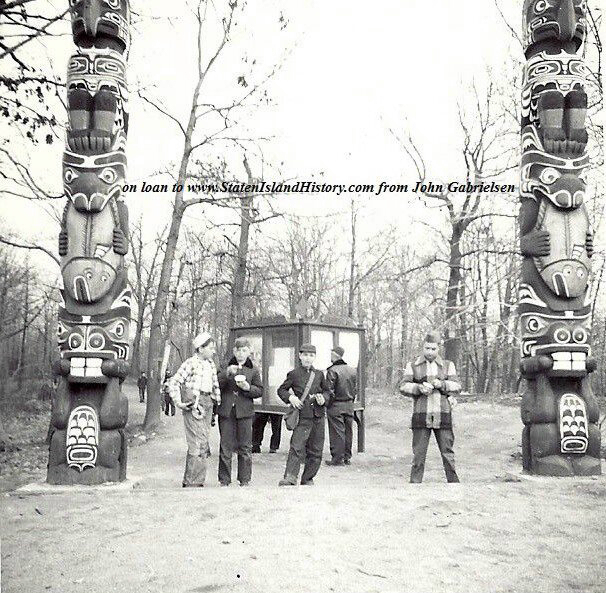 It teaches the why and how of Cub Scout camping; planning, equipment, meal preparation, fire safety, stoves, and lanterns; first aid and sanitation; nature hikes, games, and campfire programs. Participants will receive BALOO certification. Local Tour Permits require that a Pack must have a BALOO-certified adult leader attend Cub Scout Campouts and overnight activities. Please provide the training status of ALL of your Webelos leaders to John Fiore, SI District Webelos Chairman. John is also the SI Webelos Training, Activities and Program Director, and SI Webelos Roundtable Commissioner. John needs to know that each of your Webelos leaders has been trained in Youth Protection and Cub Leader Specific Training for Webelos Leaders, as well as Outdoor Leader Skills for Webelos Leaders (OWL) training. Please include whether they have Basic Adult Leader Outdoor Orientation (BALOO) training. Please include a list of all of your Webelos leaders, and what training, if any, they have had. You can send the lists, and any questions to john at jlf69ss396@aol.com. BALOO is a one day training event that introduces leaders and parents to the skills needed to plan and conduct pack outdoor activities, particularly pack camping. • Learn more about the resources available from the Greater New York Councils and BSA for carrying out outdoor activities. You asked for it and now we have it. One course. One day. Any adult who has an interest in camping and learning outdoor skills can take this course. Designed for leaders who are in charge of Pack and Webelos overnight activities, this course covers the rules, guidelines, and safety considerations for “Pack Family Camping” and “Webelos Campouts”. It teaches the why and how of Cub Scout camping; planning, equipment, meal preparation, fire safety, stoves, and lanterns; first aid and sanitation; nature hikes, games, and campfire programs. Participants will receive BALOO certification. Local Tour Permits require that a Pack must have a BALOO-certified adult leader attend Cub Scout Campouts and overnight activities.